We live on the beautiful French Riviera, in our small town Menton. 15 minutes to the west lies Monaco, where the average price per square meter for property is at 44,522 euros. 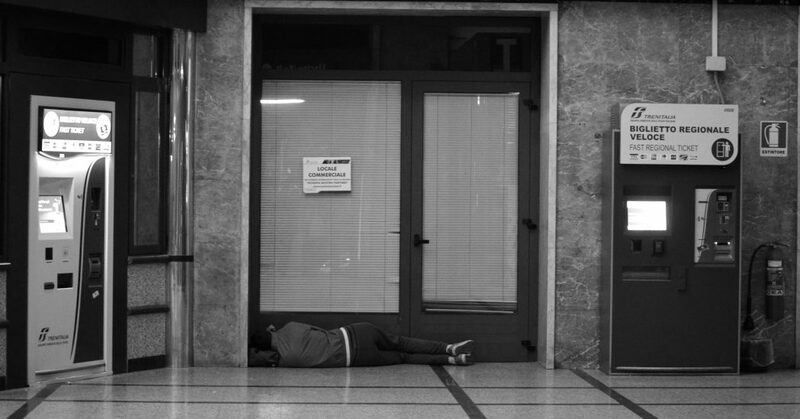 15 minutes to the east lies Italy with its border town Ventimiglia, where immigrants who travelled across the Mediterranean Sea sleep on cardboard in the local train station. Lately, much has been written about these people. 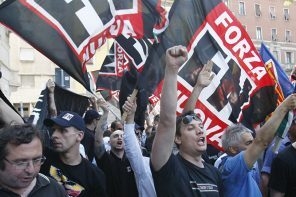 As refugee numbers mount, protests against the immigrants are on the rise throughout Europe. With many preconceived notions and little actual knowledge dominating this debate, it was time to have a look at the developments right on the doorstep. Strolling through the Italian border town Ventimiglia on a sunny day, one feels like visiting any other small city in Northern Italy. Children run along the promenade, families eat ice cream in the park, and cafes invite to sit down and watch bypassing pedestrians. With food prices being significantly lower than those in France, many French families head to the local Ventimiglia market on weekends, to purchase fresh regional produce. It takes about 30 minutes by car from Riviera’s biggest town Nice to benefit from this cross-border setting. It is only at night, near the train station, that one can understand the border’s far greater global significance. On a Saturday night in early November, about 30 people are huddled on the ground inside the train station. With temperatures dropping to 6 degrees Celsius at night, it is cold for Riviera standards and many of the people curled up on cardboard pieces along the sides of the train station’s main hall, are covered with jackets and blankets. A group of young men casually chats in one corner of the hall, bursting out in laughter from time to time. The big screen on the opposite wall announces the arrival of the last trains from Milan and Rome for the night. The first train in the morning is at 5:22, heading across the border into France. During the day, trains to France depart once or twice every hour, with the last train leaving Ventimiglia at 10:40 pm. It is these trains that the people in the entrance hall are waiting for. It is these trains that are their symbolic last step on a long journey into an allegedly better life. This year, around 120,000 people arrived on the Italian coast. Having crossed the Mediterranean in small boats, they are lucky to still be alive on the other side. According to estimates, around 3,000 people drowned this year while attempting to reach European soil. Over the last 26 years, 21,300 people are estimated to have met their death in the Mediterranean. Most of the people arriving in Italy do not want to stay, however. Out of the 120,000 that arrived this year, only 50,500 claimed asylum in Italy. 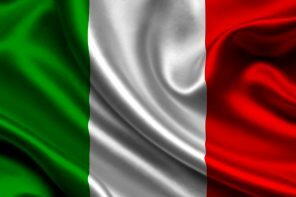 With Italy being one of the most heavily impacted European countries by the influx of immigration, the nation seems to have surpassed its limits in dealing with refugee claims long ago. The immigrants in the train station are well aware of this. Seinat is 25 and five months pregnant. Pressed into a corner of the station’s entry hall, she explains that there is no perspective in Italy. Together with her husband Birhan and their friend Antonio, Seinat left her home country Eritrea over two years ago. From their hometown they crossed the country by foot, aiming for the Sudanese border. They stayed in Sudan for about a year, trying to get settled. Seinat worked as a waitress. Europe by far isn’t the primary destination for Eritreans fleeing their country. Most of them stay in the neighboring countries Sudan and Ethiopia. But prospects weren’t promising in Sudan, which currently hosts 167,000 refugees, the majority of them Eritreans. 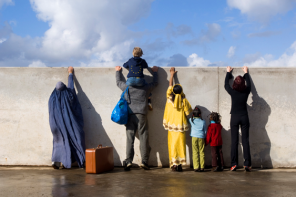 As the UN Refugee agency states, “growing numbers of the predominantly young refugees have become frustrated with the shortage of services and the absence of self-reliance opportunities in the camps.” Seinat, Birhan, and Antonio thus decided to risk crossing the Mediterranean. Stories of refugees risking their lives during this sea passage are so common that the desperation and courage it must take to get on such a boat doesn’t seem to resonate any longer. Shrugging their stories off, proclaiming it to be an exaggerated play on European compassion and guilt seems easy when reading about these accounts in the paper. After all, we can’t welcome this world’s entire suffering population… Adhering to this reasoning proves difficult, though, when looking that part of the population straight into the eyes. “You know about the situation in Eritrea, right?” Antonio asks. Actually, I have no idea. It’s one of these small East African countries that seem to be of little importance when it comes to international debates. However, 22% of all people arriving by boat in Italy are from Eritrea, making them the second largest group after Syrian refugees. 34,000 of them arrived this year alone. Seinat, Birhan, and Antonio thus each paid an incredible 1,650 US$ to cross the Mediterranean in a small fishing boat. “Your whole family supports you. Your father, your mother, your brother, your sister, they each give you money for the trip,” Birhan says. If one is lucky, there also is support from the Eritrean community in Europe, by people who supposedly succeeded in making a life for themselves in the West. Stories of other successful immigrants seem to constitute a driving force in the strong desire to make it to Europe. No matter who one talks to – everybody knows the story of someone else who made it. That the life of a refugee is all but simple in Europe seems to often be omitted in these narratives. The dream of Europe is shiny and full of possibilities. Outside the station, Italian taxi drivers are waiting for passengers who arrive with one of the last trains. Andrea is 57 years old and a taxi driver since 2009. “I used to work in an office before, but it went bankrupt during the crisis. So I started driving the taxi,” he explains. With all the immigrants in the train station, he was forced to become very cautious in deciding whom to take for a ride. “The French police told us a few years ago that we will be charged on the grounds of human trafficking if we take anyone across the border illegally. So now I’m always asking for papers before I allow anybody to get into my car.” Andrea stands for many Italians who are struggling with the current economy. His son was unable to find work in Italy and now commutes over four hours each day to work at a restaurant in France. “I’m not upset at these immigrants. In fact, I feel sorry for them. But I just don’t understand what they expect from Europe,” Andrea concludes. Faced with a struggling economy and soaring youth unemployment rates, many European countries indeed have difficulties in conveying their message of support for asylum seekers. Current developments in Germany, Europe’s most prosperous country, seem to prove, however, that opposition is not primarily based on a nation’s economic situation. With asylum claims reaching an all-time peak in 2014, protesters doubt the sincerity of claims, arguing that many of the applicants solely come in search of economic advantages. It is primarily for people like Habib that the French national police sends specific units to seal the border between Ventimiglia and Menton, some sources say. Officially, the French authorities base their right for checks on a European accord from 2013, which allows the temporary reintroduction of border controls within the Schengen area in cases of security risks. With asylum seekers on the rise, border controls are stationed on all routes into France: the two main roads and the train station. While cars are subjected to random checks, every train entering Menton is stopped and searched for illegals, based on racial profiling. “It’s a tough job,” a few representatives of the border police admit under the condition of anonymity. “Sending women and whole families with children back across the border is hurting me every time. But then you can’t let these stories get too close to you, or you wouldn’t be able to do your job any more.” It might be possible that the border police are faced with one of the hardest tasks in this story of European immigration. Demonized by great parts of the public, they fulfill a duty that legal conditions subject them to. “I feel genuinely sorry for these immigrants and I understand their hope for a better life. But at the same time I also understand the necessity for not allowing everybody in,” one of the men says. Sending the immigrants back to Italy is indeed an action that the French authorities are even obliged to adhere to under European law. According to Dublin II, a regulation that came into force in 2003, claims need to be examined in the refugee’s first European country of entry. But even the refugees themselves are aware of the immense overload of claims that the Italian system is struggling with. “You need to be careful that they never get your fingerprints in Italy,” Seinat, the Eritrean woman, says. “Once they have your fingerprints they know which country you came from and then it’s over.” According to her and many others in the station, primary countries of entry like Italy and Greece are so overwhelmed by the amount of immigrants that they simply stopped taking fingerprints. Some people doubt, however, that the border police are returning immigrants indiscriminately of their backgrounds. Valter Muscatello is the head of Ventimiglia’s Red Cross, which assumes responsibility in emergency situations. He cites reports according to which the French authorities are rejecting immigrants selectively, based on assessing their risk of immigration to France. Tunisians are thus rigorously sent back, while other immigrant groups like Pakistanis are allowed to pass, knowing that France is just a transit country for them. Europe’s way of dealing with the immigrants surely is a Ping-Pong game between the Union’s member states. The situation at the Italian-French border is a microcosm of the continent’s overall challenges in finding an effective approach to the regulation of immigration. Outside the train station, shady figures offer rides across the border. 70 euros is how much they demand for a trip to Nice. But the immigrants learned to be mistrustful. Too often have they witnessed how others cash in on their misery. 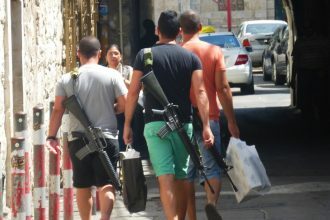 “You can’t trust anyone,” the Eritreans say. As such, all the small groups in Ventimiglia’s train station stay among themselves. Although they all share a similar story, everyone fights for himself. In a system, which screens so ruthlessly, there seems to be no room for sympathy. While there are people like Habib, the Tunisian who deliberately intends to take advantage of Europe’s system, meeting some of Ventimiglia’s refugees made it harder to continuously ignore the despair behind many of Europe’s refugee stories. With more and more refugees arriving in Europe, it is thus not only crucial to take a close look at the figures. The situation might instead actually offer the opportunity to meet the people and encounter the stories behind these statistics. Upon returning to my warm and cozy French apartment, I couldn’t help but feel overwhelmed by the tremendous spectrum of lives that lays within the short ride from Monaco to Ventimiglia. Maybe these fundamental differences simply represent the inevitable realities of the world we live in. Not being able to change the overall situation, however, doesn’t give anybody the right to shut his eyes to these apparent shortcomings. Christoph Trost, Sara Furxhi, Jackie Rudich, Emma Bubola, and Irene Biundo contributed to the research of this article. Chocolate and Indian food-addicted, Tina enjoys controversial discussions as much as a hike up into the mountains. She started her degree at Sciences Po after having walked down a few unusual trails across the globe and is now trying to bring LeZadig into the world by optimizing its Search Engine performance. Video Debate: Feminism – A No Man’s Land?